As an all-inclusive, welcoming and accepting club, people of all ages and disabilities can come to feel their best and grow together. Members across the spectrum experience a safe haven to explore and satisfy their sensory needs in a safe, nurturing, and fun environment. We encourage growth and positivity through the use of our unique sensory gym and multi-sensory environments. The Sensory Club is funded by our members and private contributions. Therefore, financial gifts of any amount make a timely impact. Funding that is received is put to immediate use, benefiting the greatest need. Each donation makes an impact by changing our society to welcome and accept people with special needs. Although every special-needs child is different and every family is unique, the experiences available help grow confident, caring and capable kids. 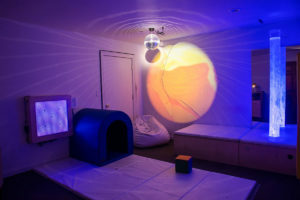 Our sensory gym and private multi-sensory environments allow children to be comfortable with themselves and explore their own individual sensory needs. All sensory experiences available benefit them to grow beyond the expectations of doctors and therapists. As parents transition from a leading role to a more supporting role in their child’s development, we’ve created a community for pre-teens and teens to connect and support each other. 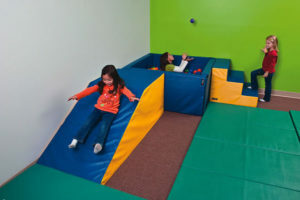 Our sensory gym and private multi-sensory environments are built with adult equipment to allow parent-supervised teens to explore their own sensory needs and enhance their individual progress. As an adult with special needs, we want to help you continue to be self-sufficient in your daily living activities. Our club’s grown-up playground and private multi-sensory environments provide a safe haven and outlet to satisfy your personal sensory needs. Our club also offers an opportunity for members to build accepting relationships with a community of friends. Through early to late stages of dementia and Alzheimer’s, we want to help you engage in activities that support your health and better your connection with your family and environment. Through the use of controlled stimulation in our multi-sensory environments, your brain’s functional activity can increase and anxiety can decrease.